Turkish President Recep Tayyip Erdogan has suffered a heavy blow after his ruling AK Party lost control of the capital Ankara for the first time in nearly two decades and is on course to lose the commercial hub Istanbul in a local election. There has been a tense standoff in Istanbul as both the opposition and the AK Party claimed victory in the polls due to a narrow margin. The mayoral candidate of the main opposition Republican People’s Party (CHP), Ekrem Imamoglu, and official results said on Monday, Imamoglu was around 25,000 votes ahead in the Istanbul vote count. The AKP's provincial head said on Tuesday it had submitted objections to local election results in all 39 Istanbul districts. “As of 15:00 today, we have submitted all our appeals to the district electoral councils,” Bayram Senocak told reporters in Istanbul. Rival Imamoglu said on Tuesday he was saddened the AKP did not congratulate him after the election board count put him ahead. A defeat in Istanbul, where Erdogan launched his political career and previously served as mayor, would deliver a symbolic shock to the president. 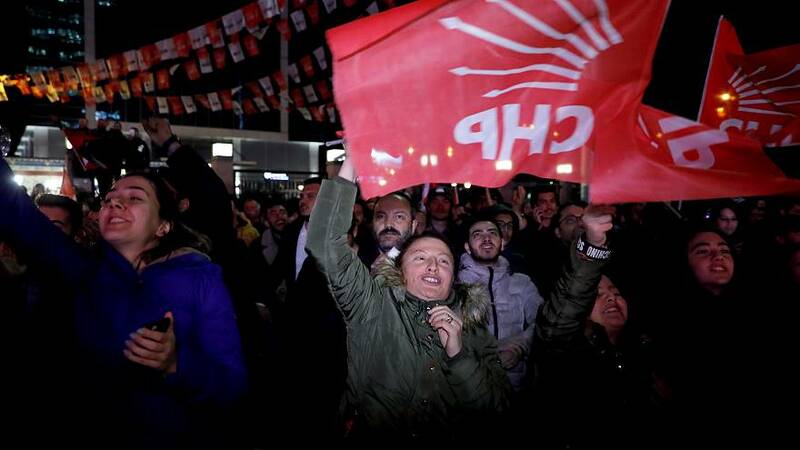 The AKP is also disputing the result in the capital Ankara and has submitted objections. Mansur Yavas, the CHP’s newly elected Ankara mayor received 50.9% of votes in Ankara, defeating his AKP rival by nearly 4 percentage points. Nationwide, the AKP and its right-wing Nationalist Action Party (MHP) allies won 51.6% of the vote. The AKP alliance "retained a majority of the national vote—around 52%—and will continue to govern more than half of Turkey’s cities and districts. "However, neither the vigorous campaign of Recep Tayyip Erdogan, the president and leader of the AKP, nor the AKP’s control of the media were sufficient to offset the negative impact of the weak economy on the AKP's popularity." Turkey's economy has been declining following a currency crisis last year when the lira lost more than 30% of its value. Sunday's vote showed some voters appeared to punish the president for the economic woes. Unemployment is on the rise and inflation is close to 20%, forcing prices up, making the cost of living more difficult for many. Erdogan said he would now turn his attention to fixing the economy without compromising free market rules ahead of a national election scheduled for 2023. "We have a long period ahead where we will carry out economic reforms without compromising on the rules of the free-market economy,” Erdogan said. Last week, Erdogan blamed the country's economic woes on attacks by the West. The president has also pointed the finger at interest rates and said if the central bank lowers them, price pressures will come down too and that Turkey would overcome its troubles following Sunday’s vote.
" Losing major cities is a blow to the AKP given the public resources the cities command. However, Mr Erdogan's tight grip on national institutions and the media mean that he will continue to dominate Turkish politics in the coming years," Demarais said. READ MORE: Why Turkey's local elections have become a key national battle?